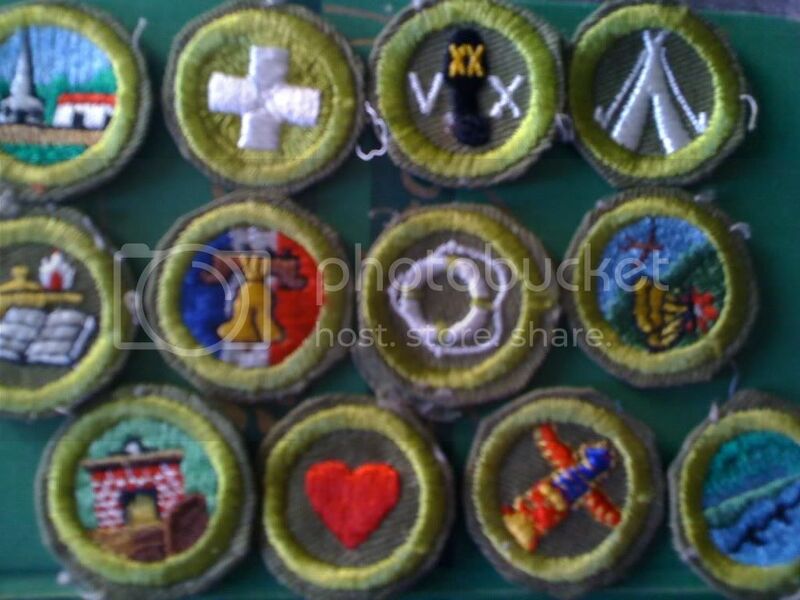 Available Trades have been updated. E-mail me for any trades/questions. This list will be updated as often as possible. If there is something you are looking for, but do not see, please feel free to email me and ask if I have it or know anyone who does. 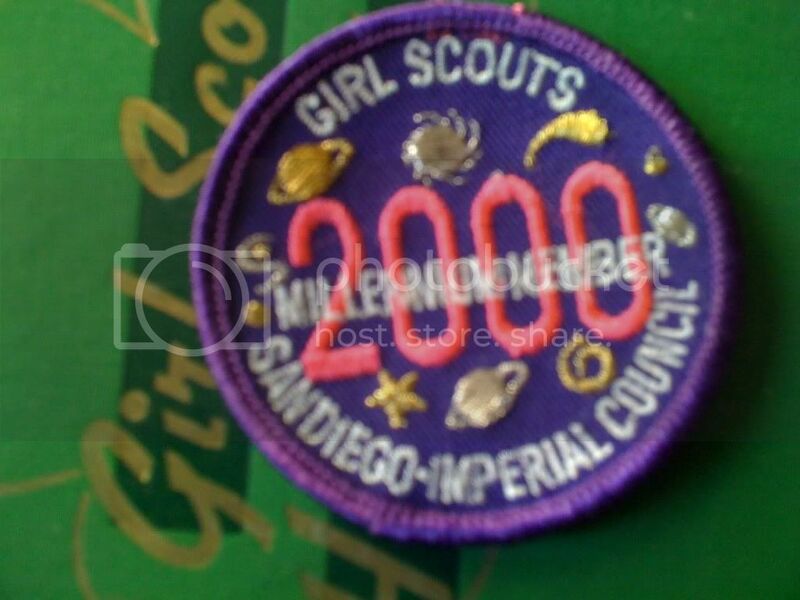 I list the size as an estimate, with circular patches as 2-2.5" diameter as "small," 3" as "standard" and 3.5+" as "large." 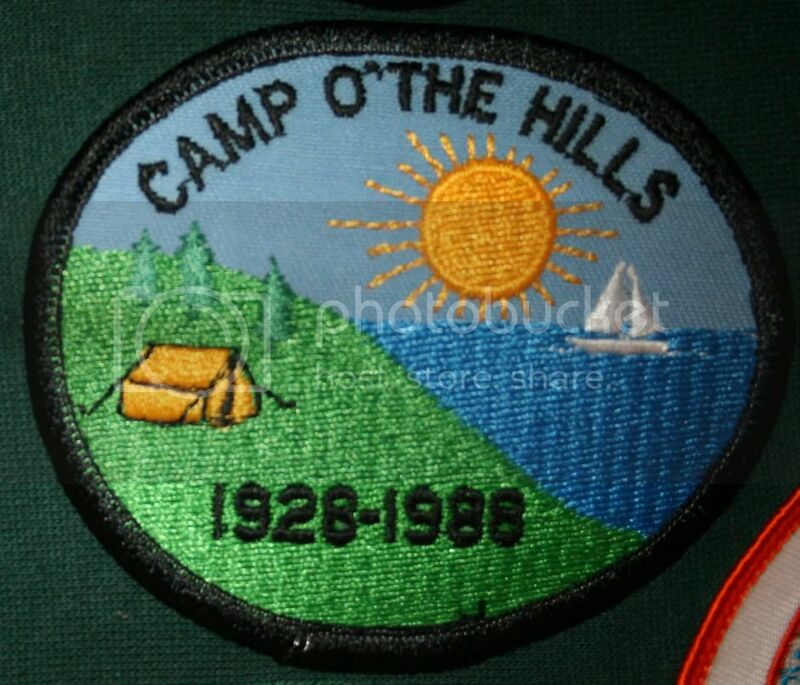 Click on the patch name to see a picture of the actual patch! 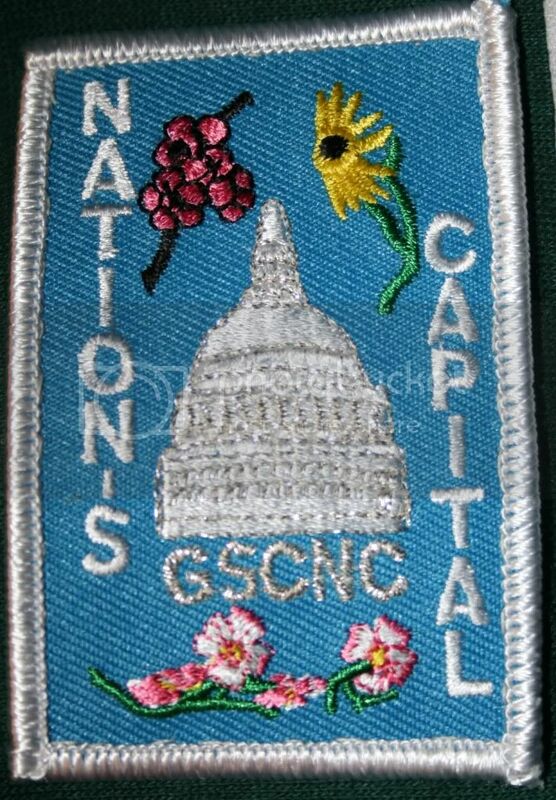 These are new Girl Scout Centennial Patches. 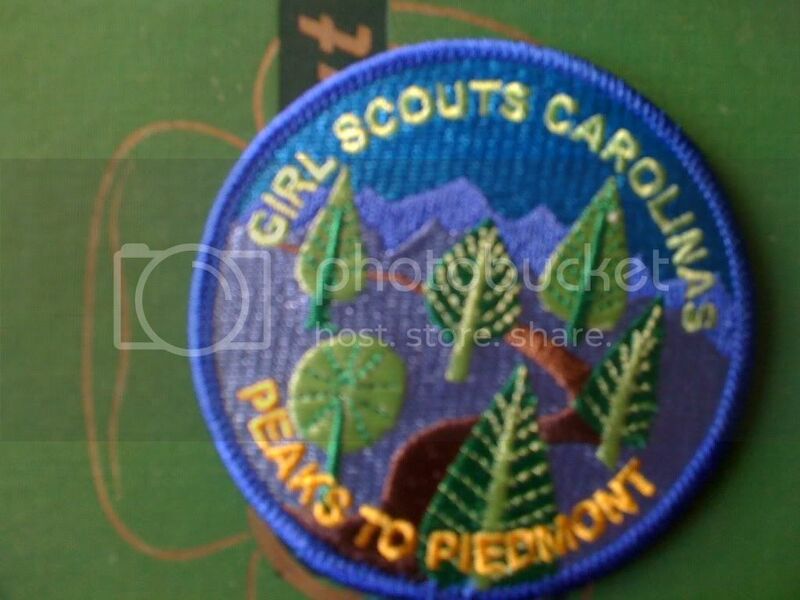 While they are probably available all over the US, anyone outside the US looking to trade may be interested. 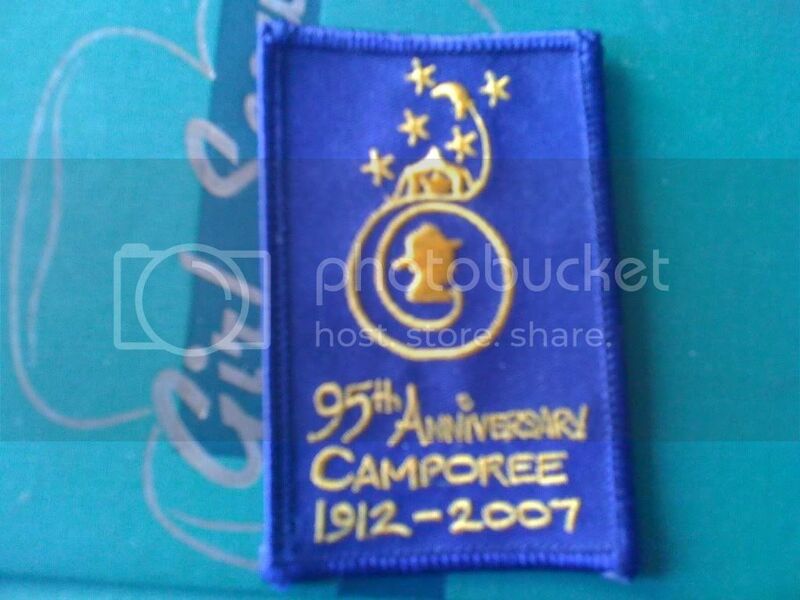 I would love to trade for a Guides centenary patch (I only have one), and I can pick up as many as needed. 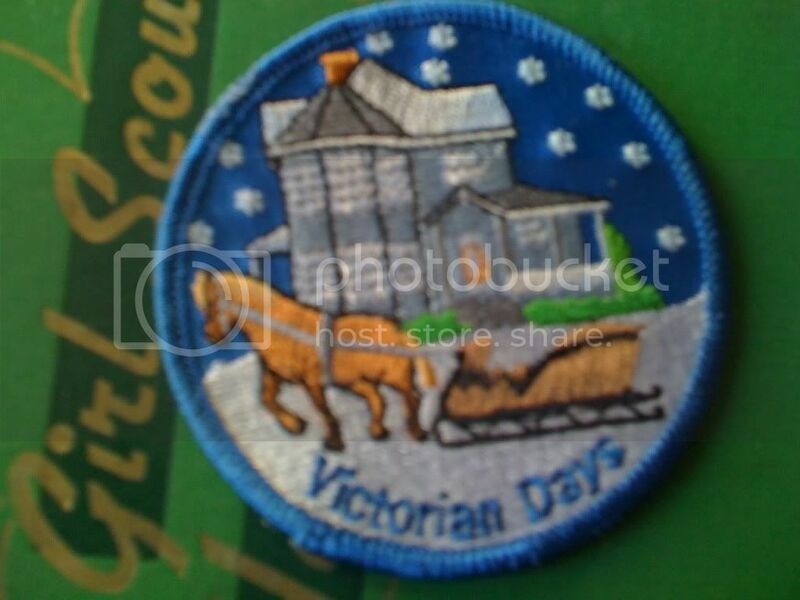 Standard size, very traditional yet cool. 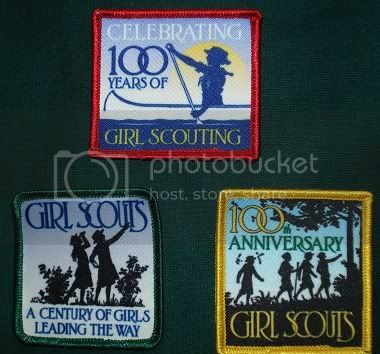 I can get as many as needed, and would LOVE to trade for Guide 100th patches. 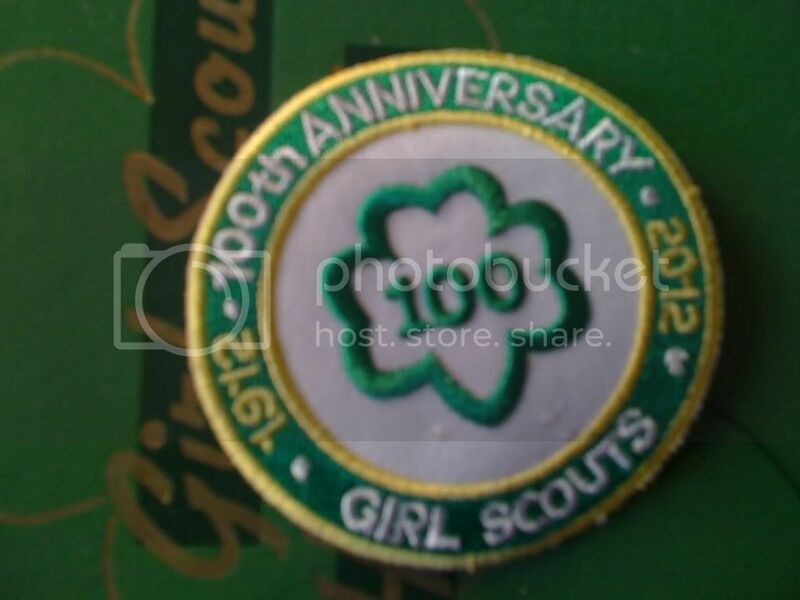 The "New" Trefoil shape and the "100" say it all! 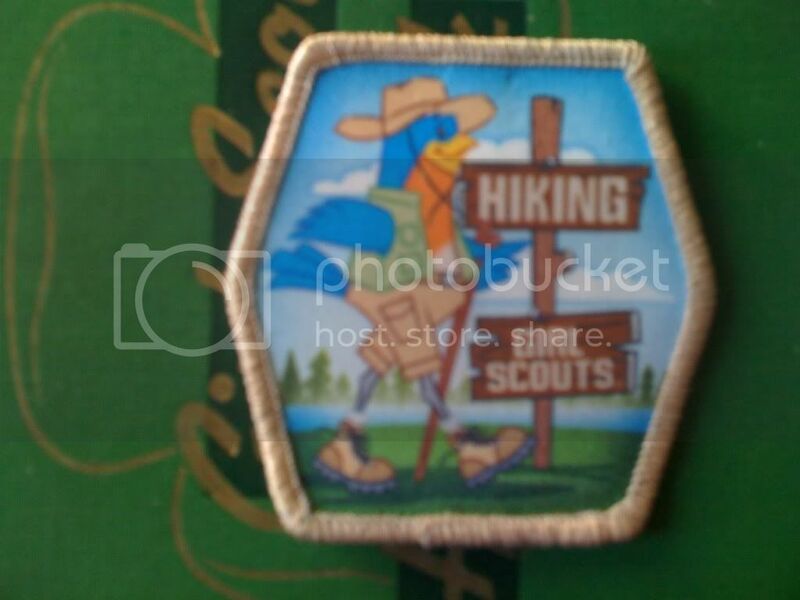 This pin is about an inch and super cool! 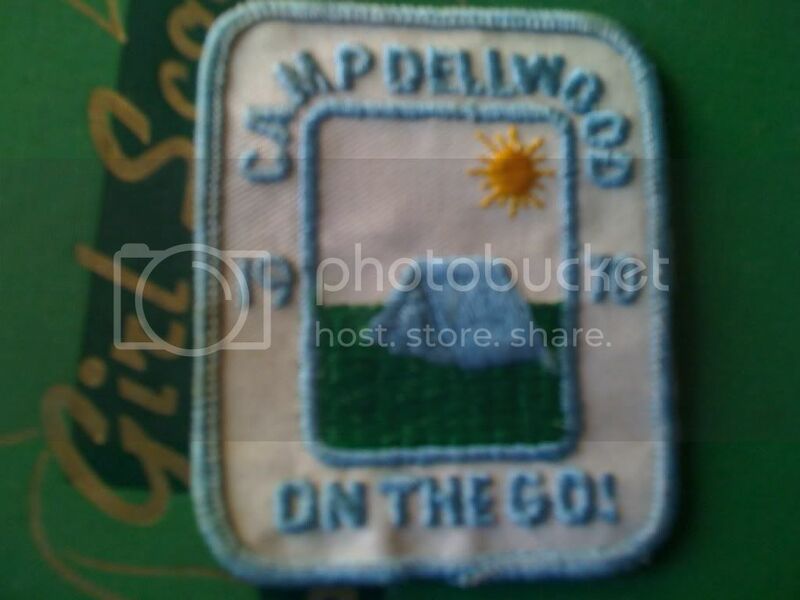 This patch is about 3" across. 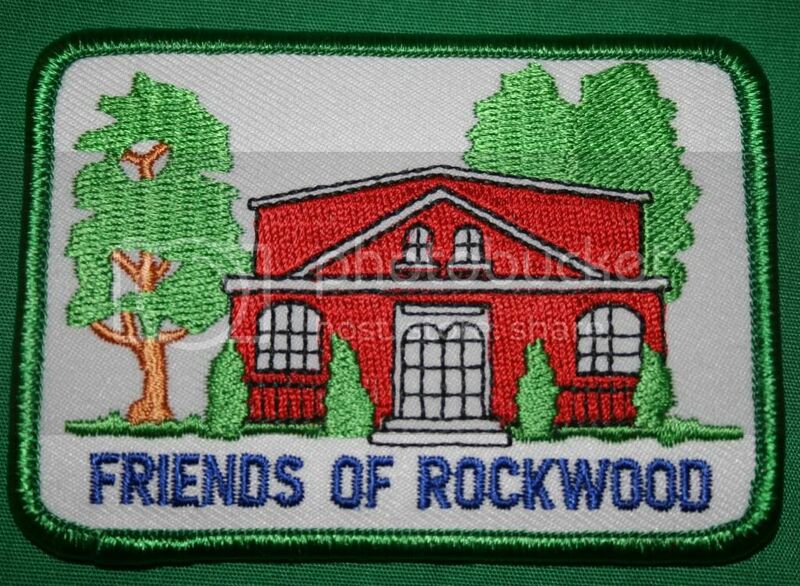 This patch is about 2". 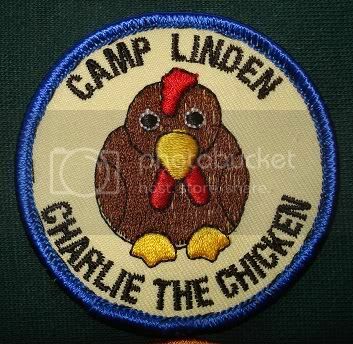 A patch for the popular camp game involving a rubber chicken! 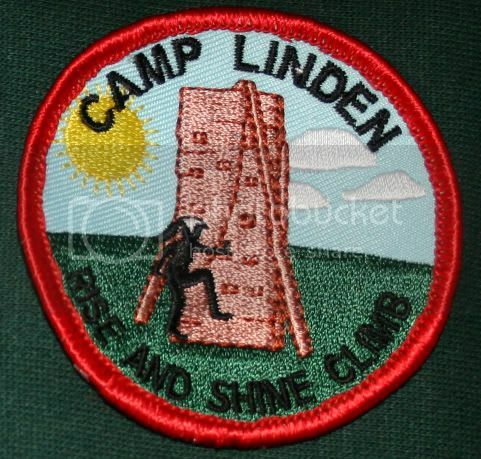 This patch is about 2.5". 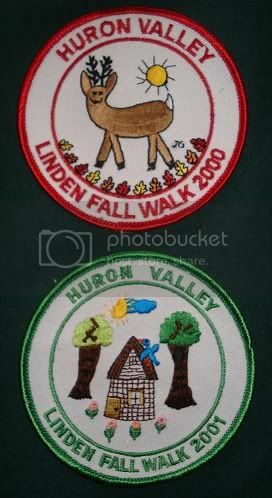 Huron Valley GS Camp Linden Fall Walk 2000 & 2001. 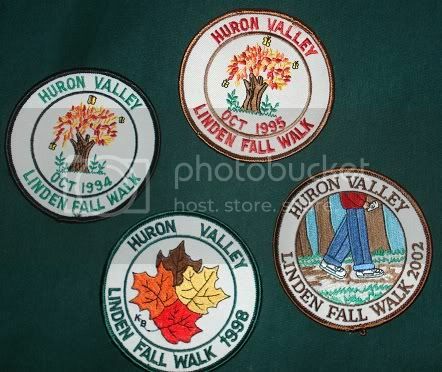 Huron Valley GS Camp Linden Fall Walk 1994, 1995, 1998, and 2002. 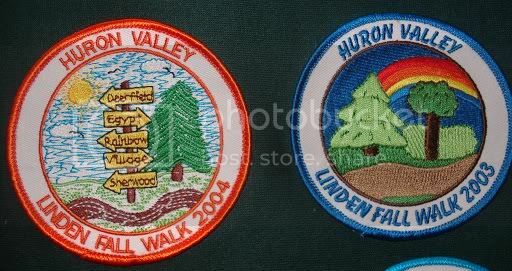 Huron Valley GS Camp Linden Fall Walk 2003 & 2004. 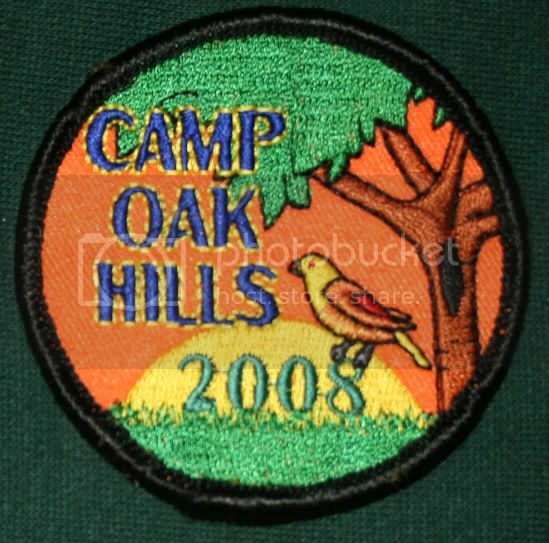 These patches (1994-2004) are larger than usual patches, they are about 3.5 inches diameter. 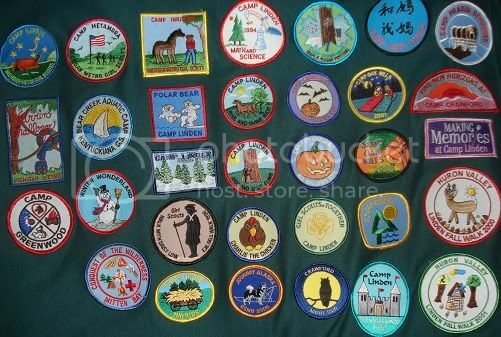 I have a few of each, except 2004 which I only have one of (so once it is gone, I'll make a note of it here). 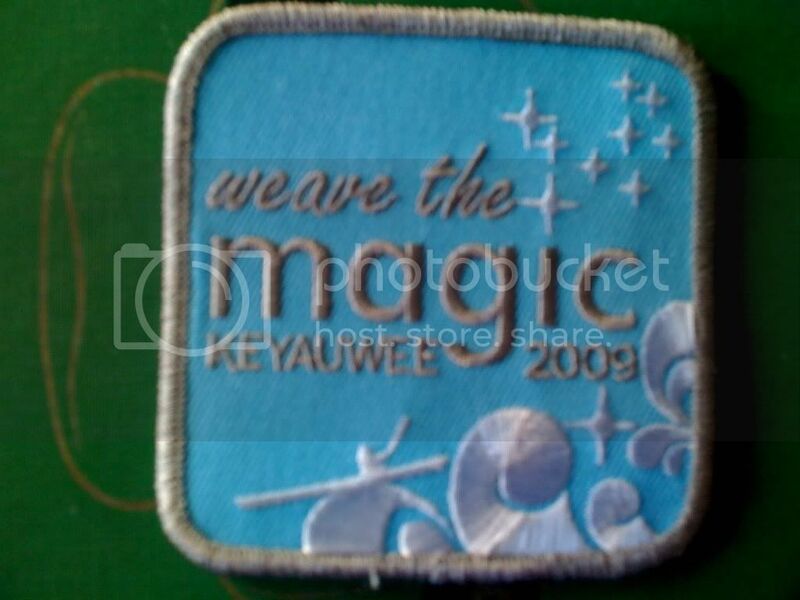 This patch is about 2.5" diameter. 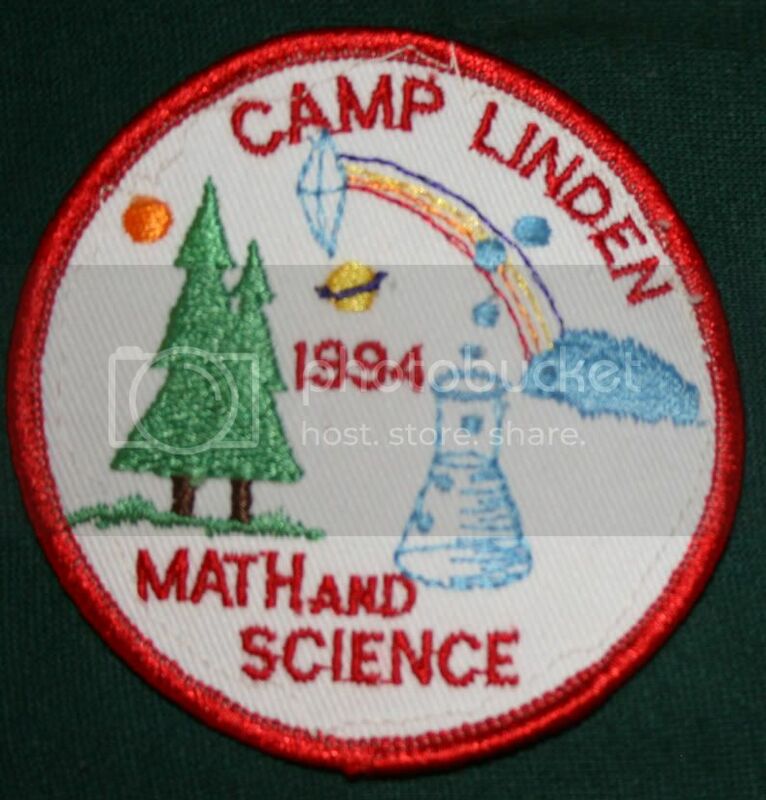 This patch is about 2" diameter. 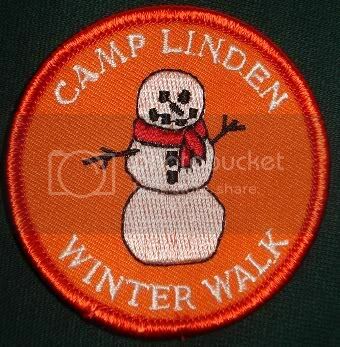 This patch is about 3.5" across. 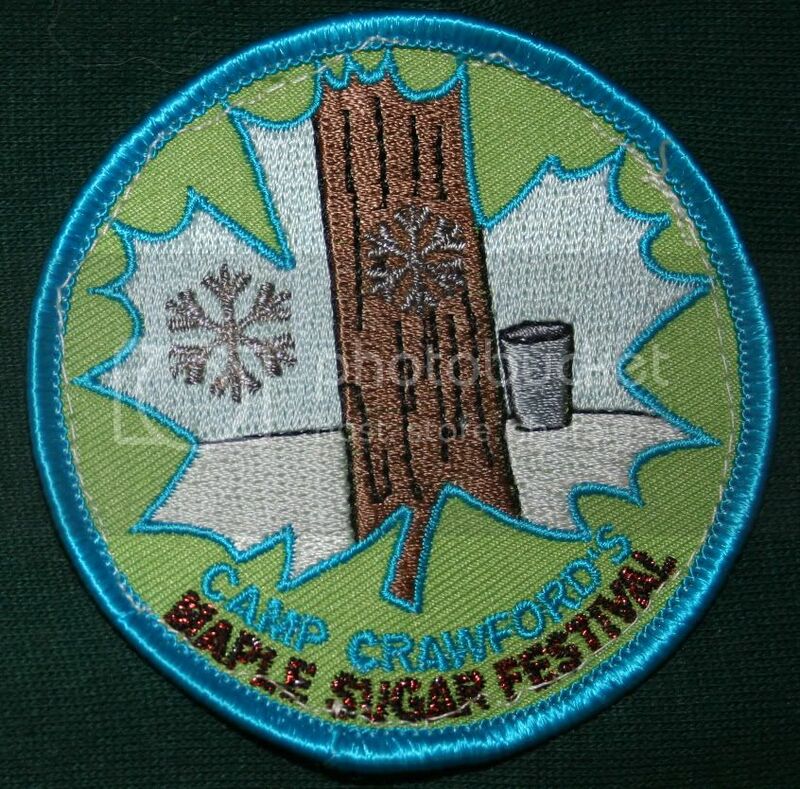 learn about the history of their area, and of maple sugar. They see how it's made and even get a taste! 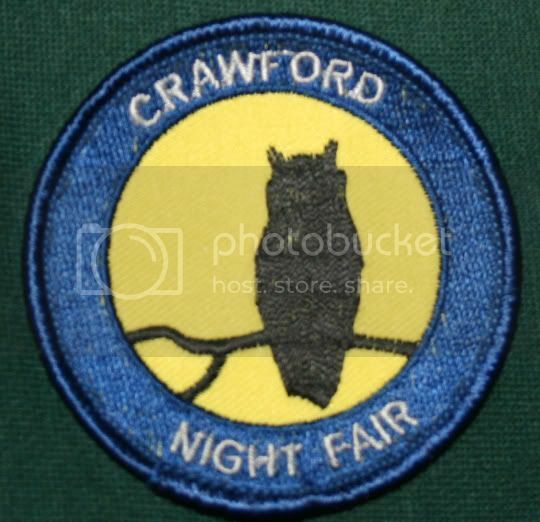 Every year Crawford hosts for the weekends near Halloween their All Hallows Eve activities. 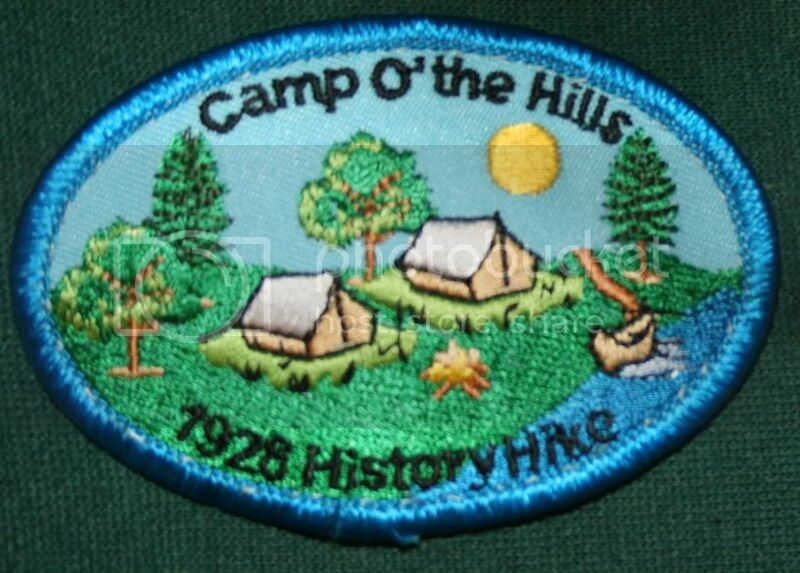 There are night hikes, "spooky" stories, up close nocturnal animals (like owls! ), and home-made root beer. 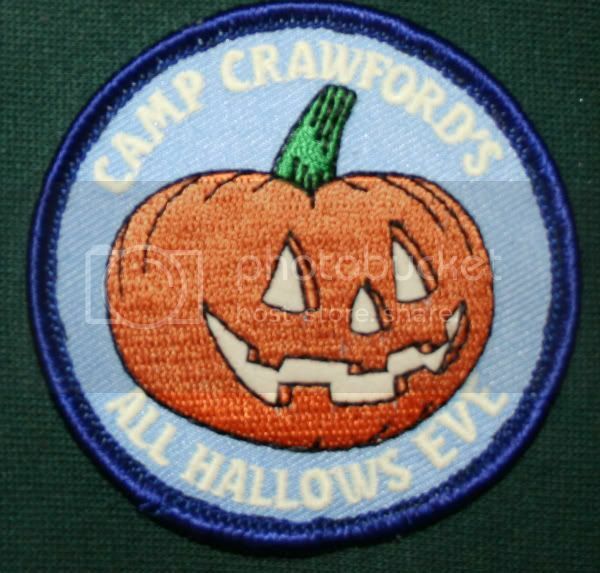 This patch is cool because the smile and the text glows in the dark! 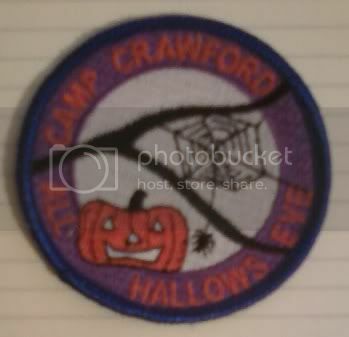 Camp Crawford All Hallows Eve Spider 2"
Like the pumpkin one, this patch glows in the dark! 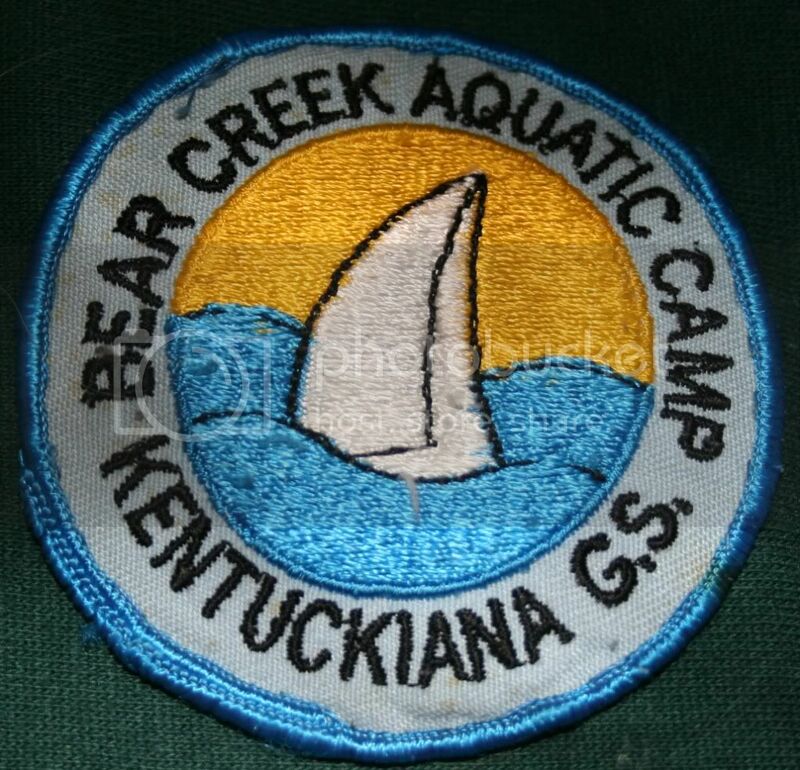 Bear Creek Aquatic Camp - Kentuckiana GS. 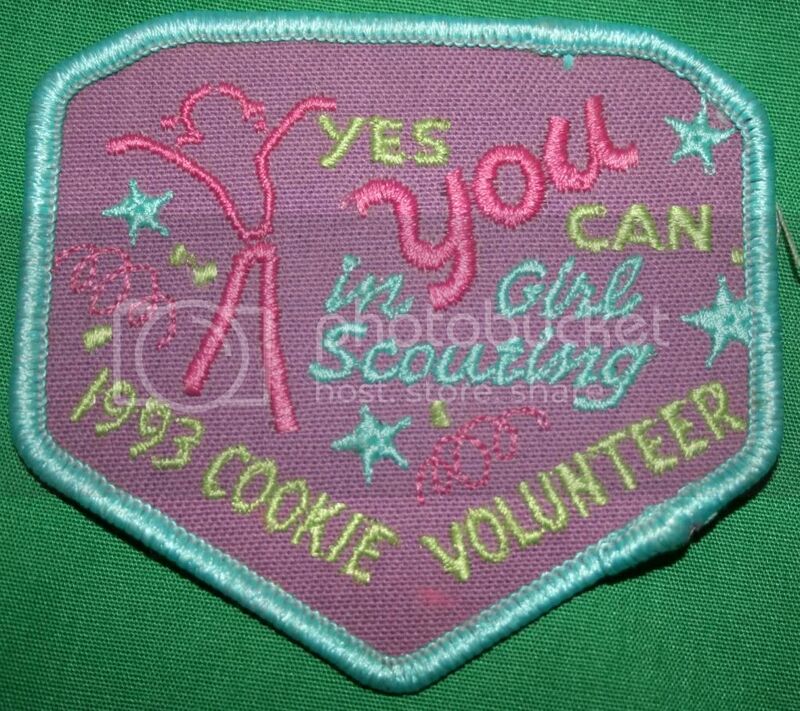 This patch is from the early 1990's. 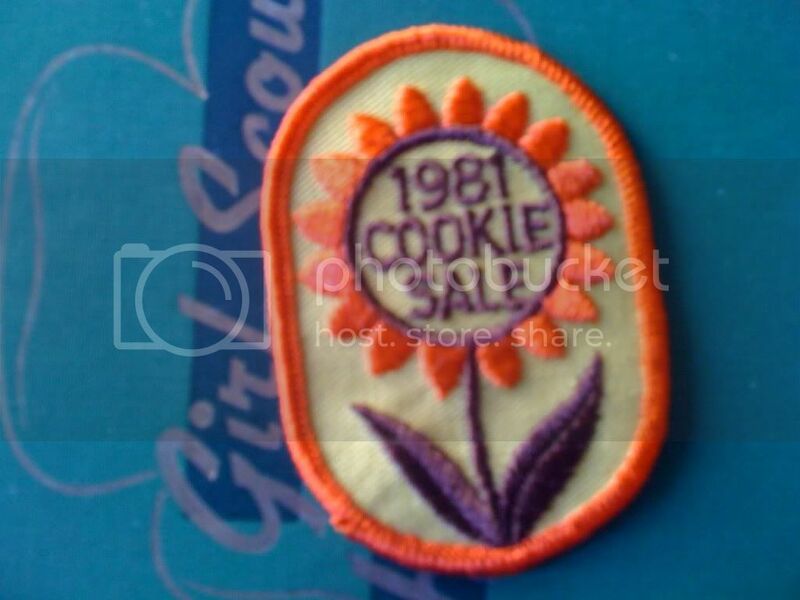 About 2.5" Some show minor wear, but not as much as the one pictured. 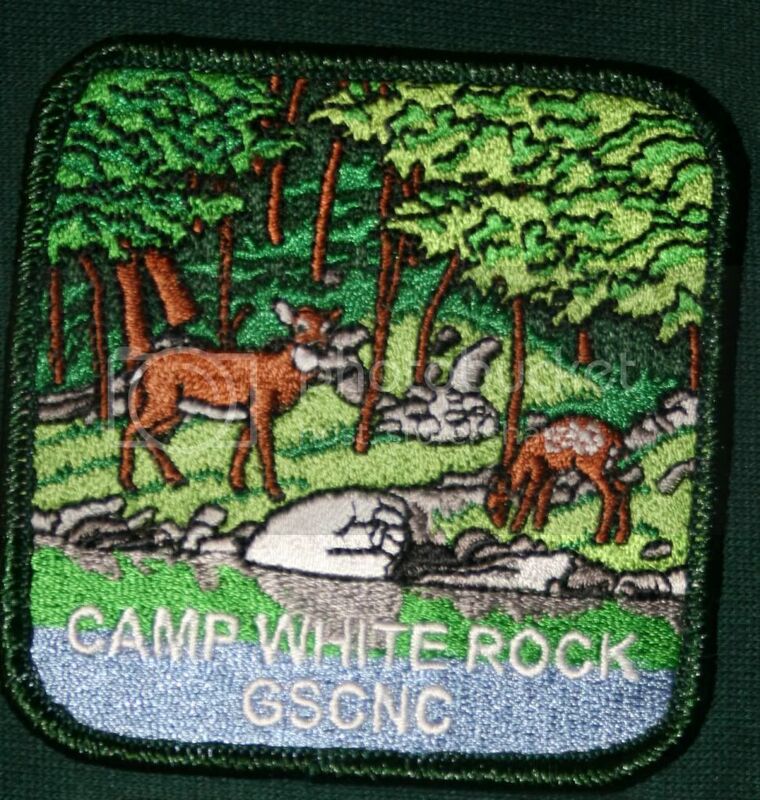 This patch is from the early 1990's. 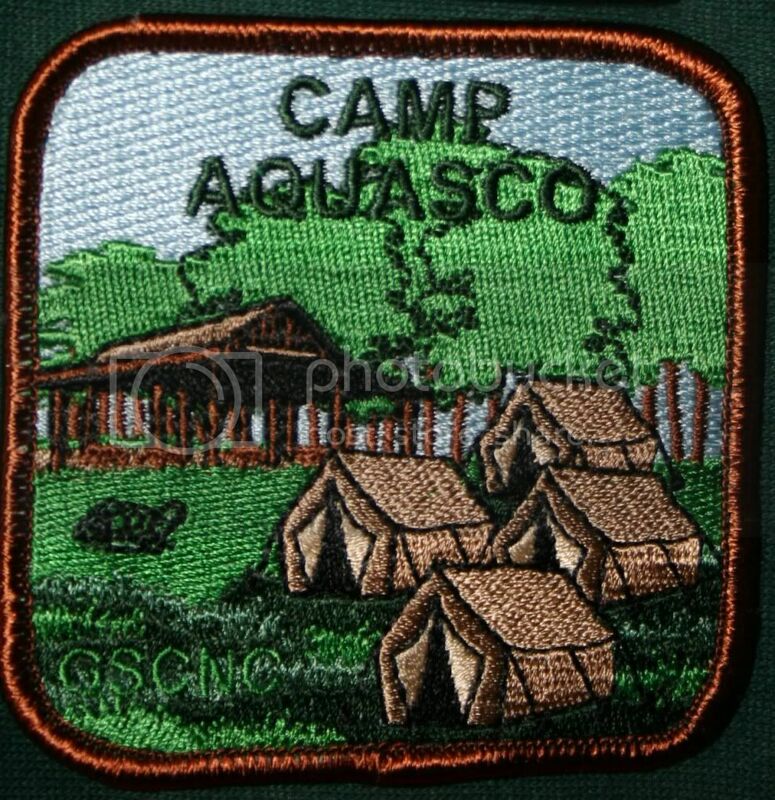 About 2.5"
The patch for trade is exactly like this one pictured, except there is a slight water strain. I will try and wash it out of someone would like to trade for it. 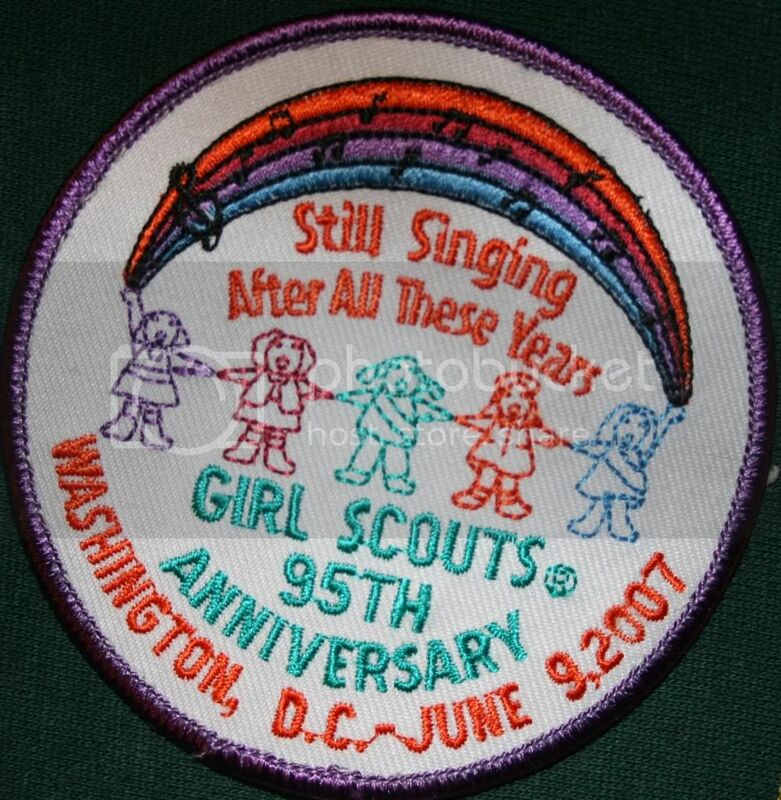 Girl Scouts 95th Anniversary in DC "Still Singin'"
Council patch, new design. Very cute. 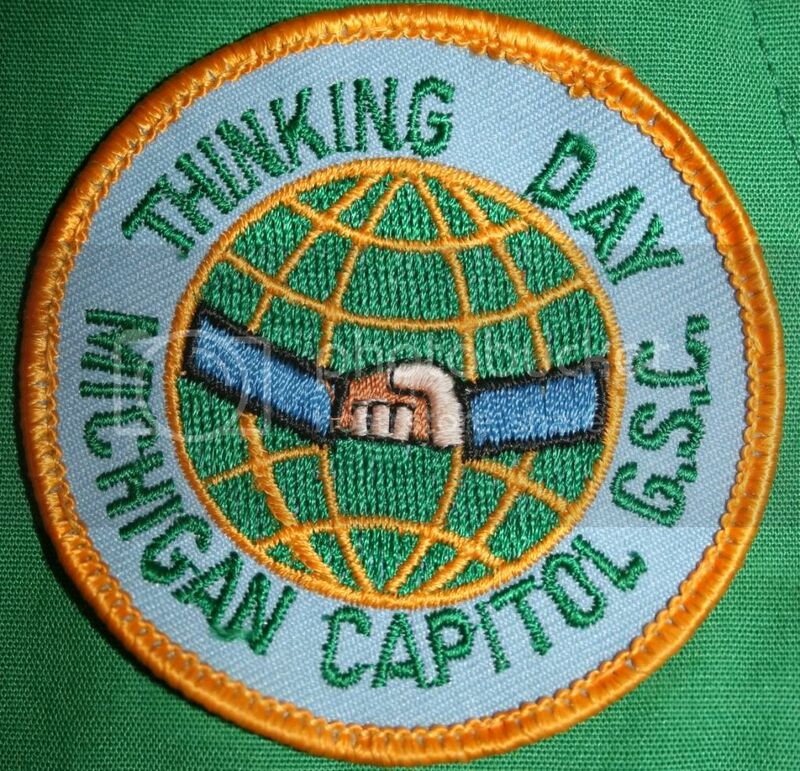 Thinking Day from the early 90's, from the Michigan Capital (Lansging, MI) GS Council. 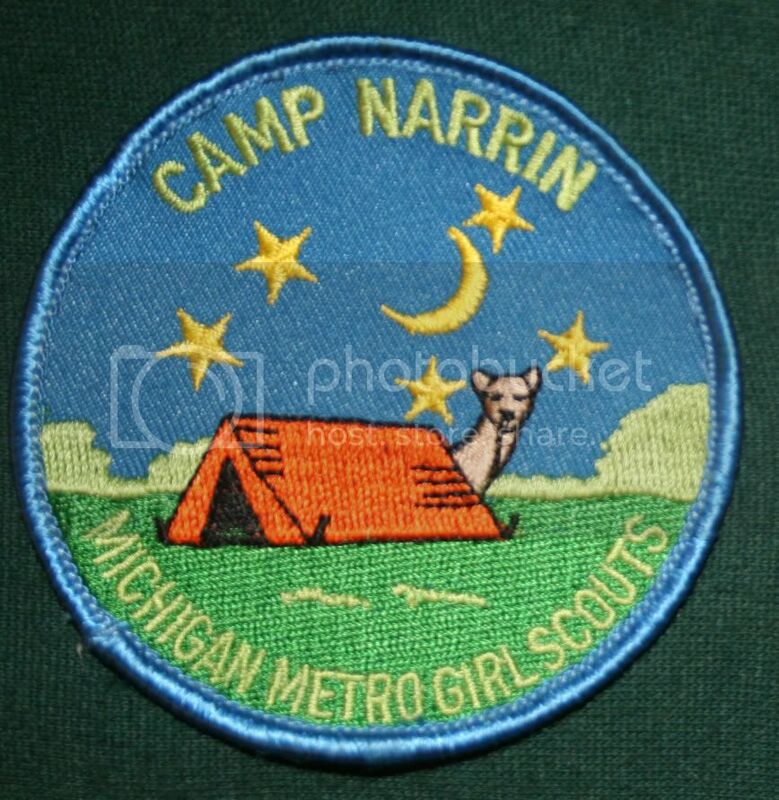 Now part of Heart of Michigan. 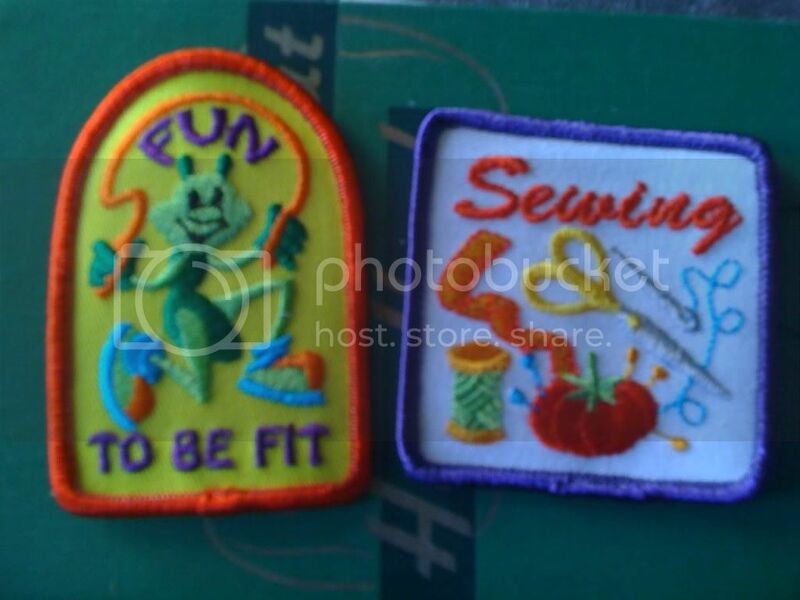 Felt patch, old but in decent shape. 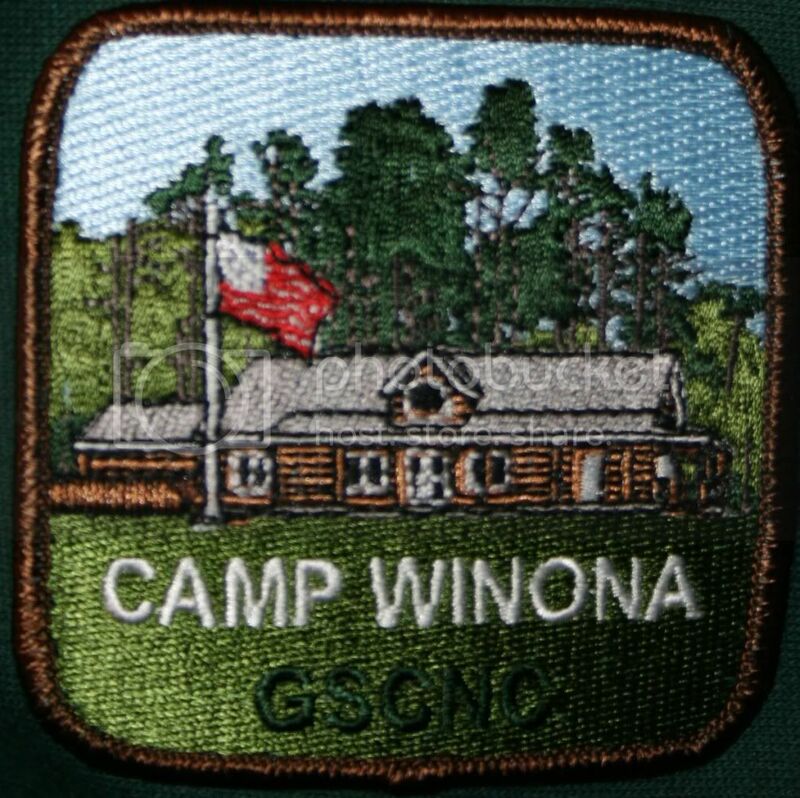 2009 camp patch. Find the kayaker? 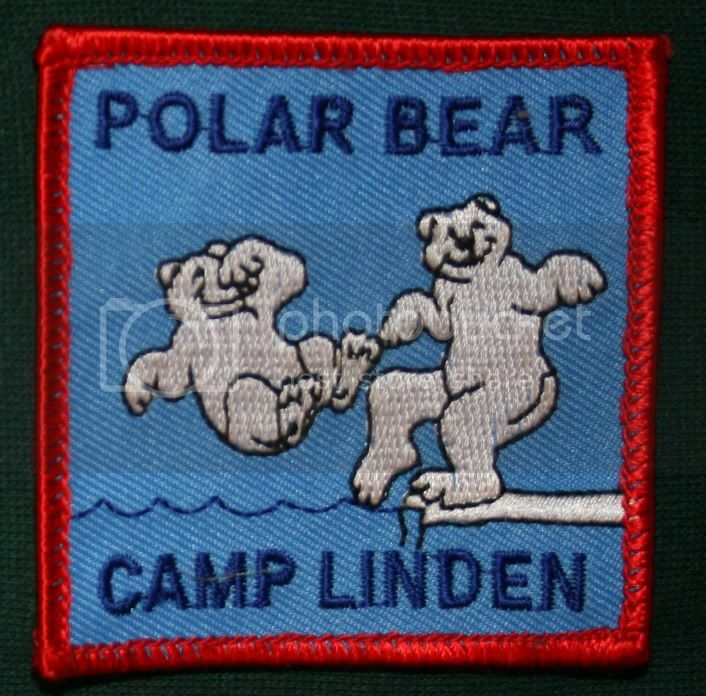 There's a camp for that. 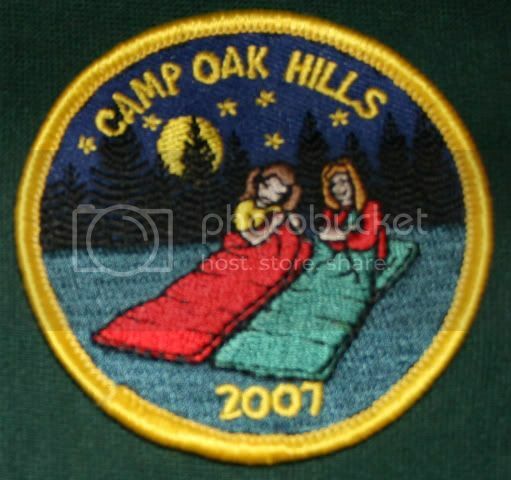 Coolest camp patch? Maybe. 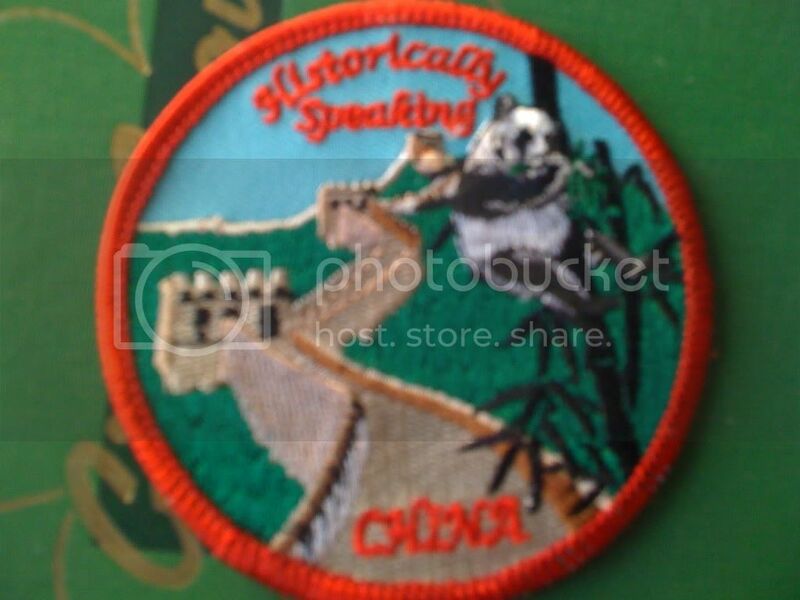 Fun/Participation Patch featuring a hiking Robin. 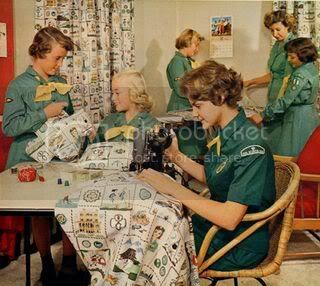 Girl Scouting in the New Millennium. 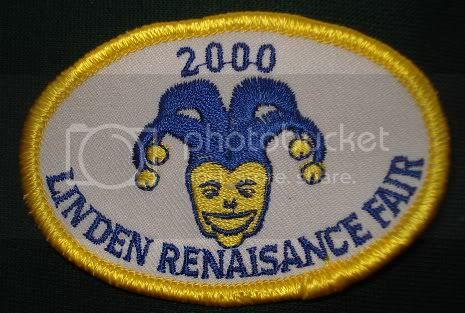 Possibly an older version of the badge, this is a standard sized participation patch. 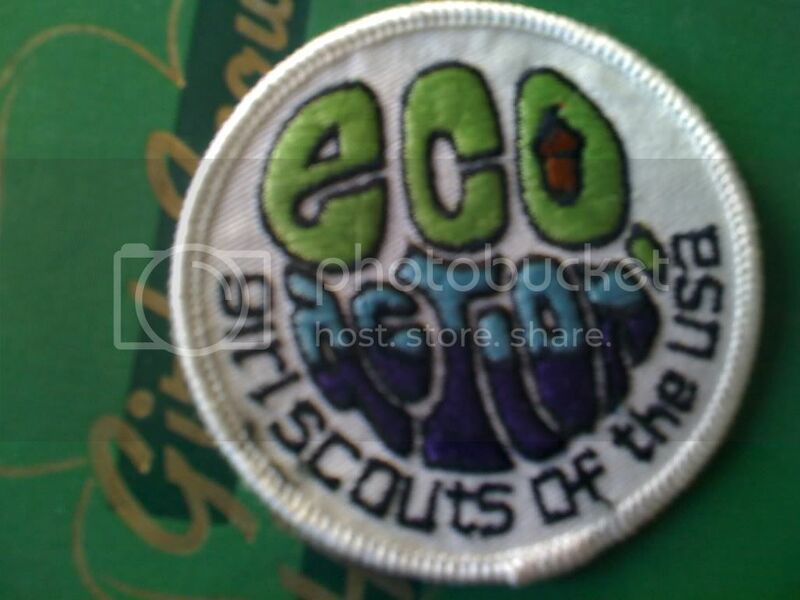 No idea, but it looks like a guide/scout collaborative patch. 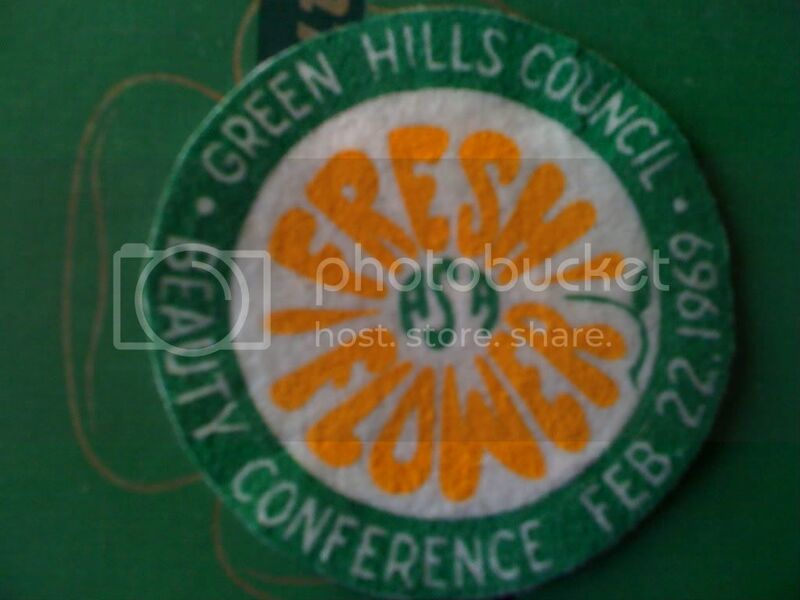 Vintage, not in bad shape but has seen better days. No idea. 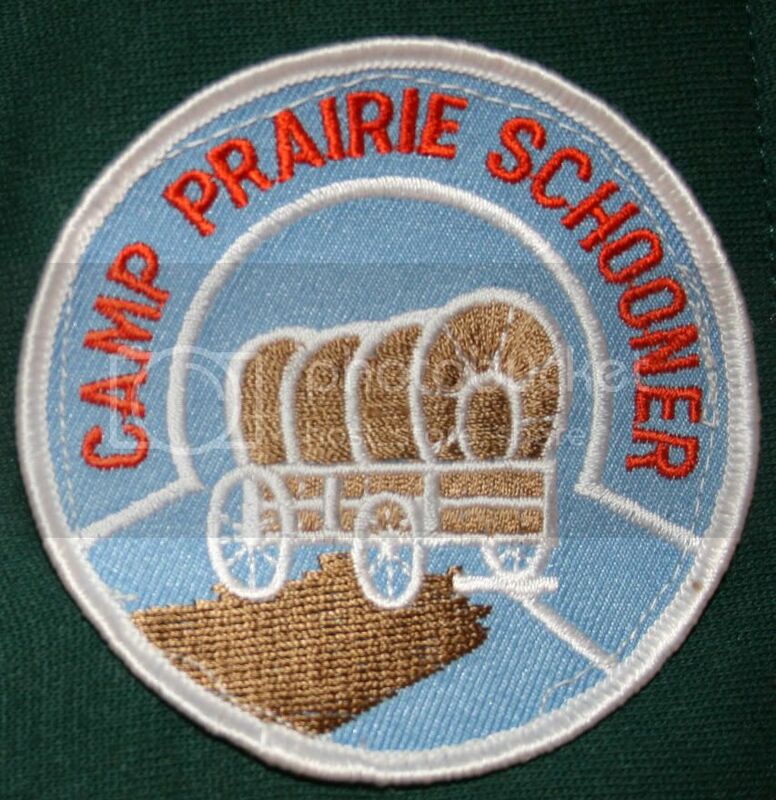 Boy scouts? 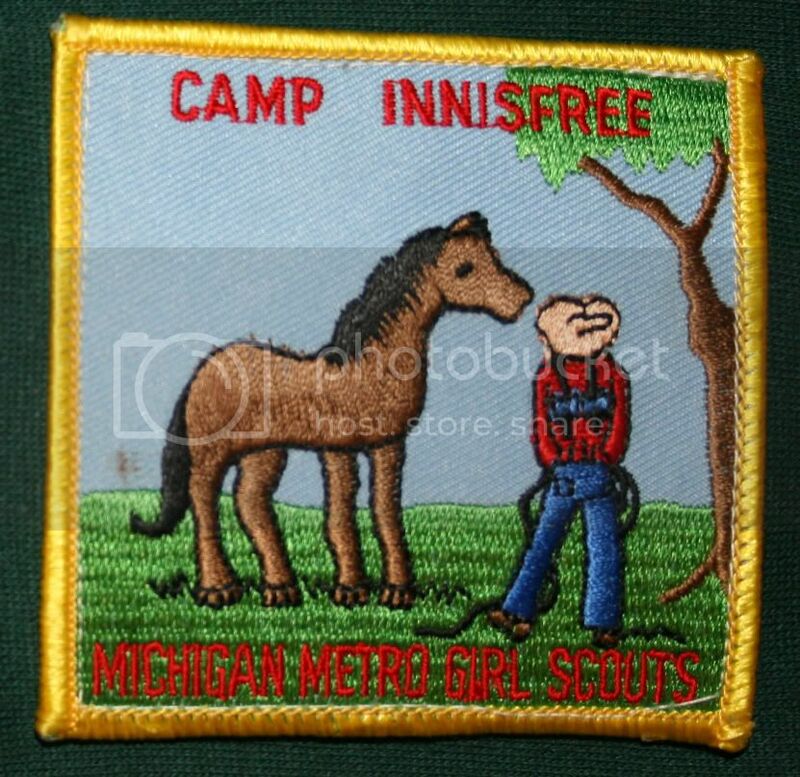 Campfire? 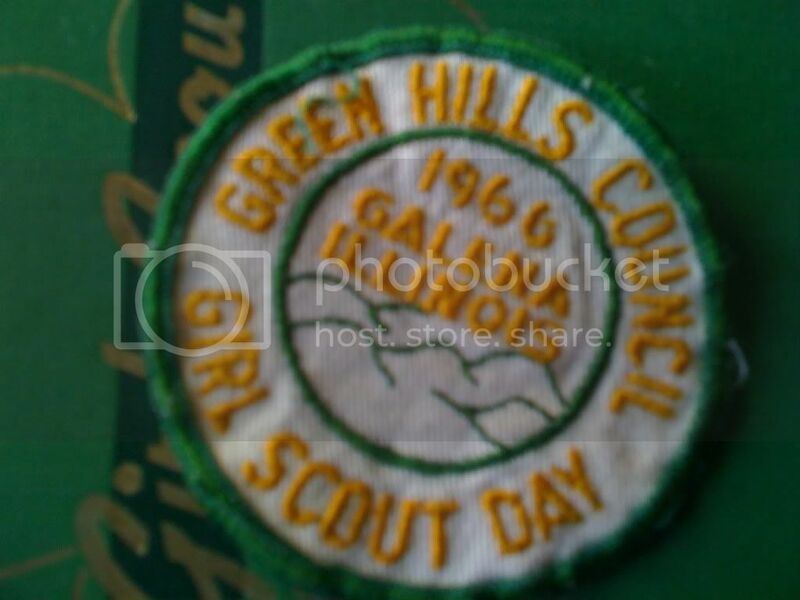 1960's Girl Scouts? Anyone have any ideas? 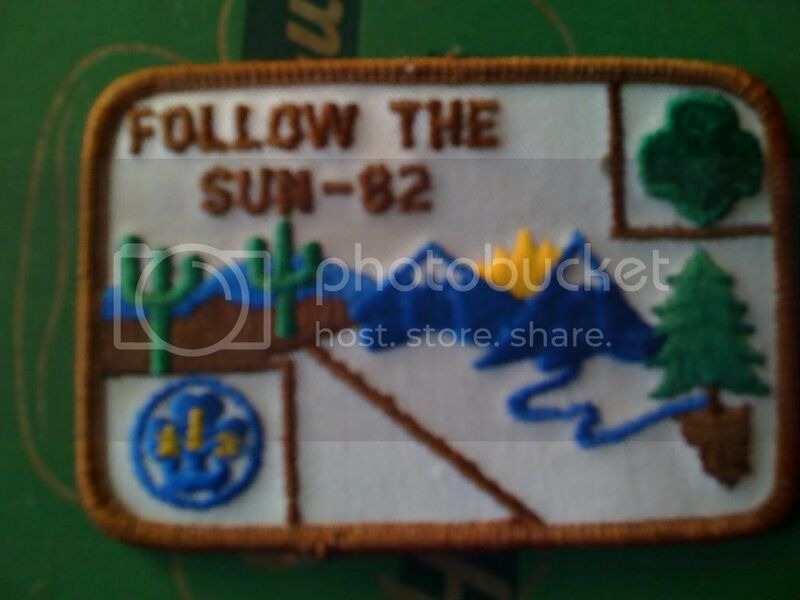 Clicking Links in the descriptions will take to you a picture of the patch. 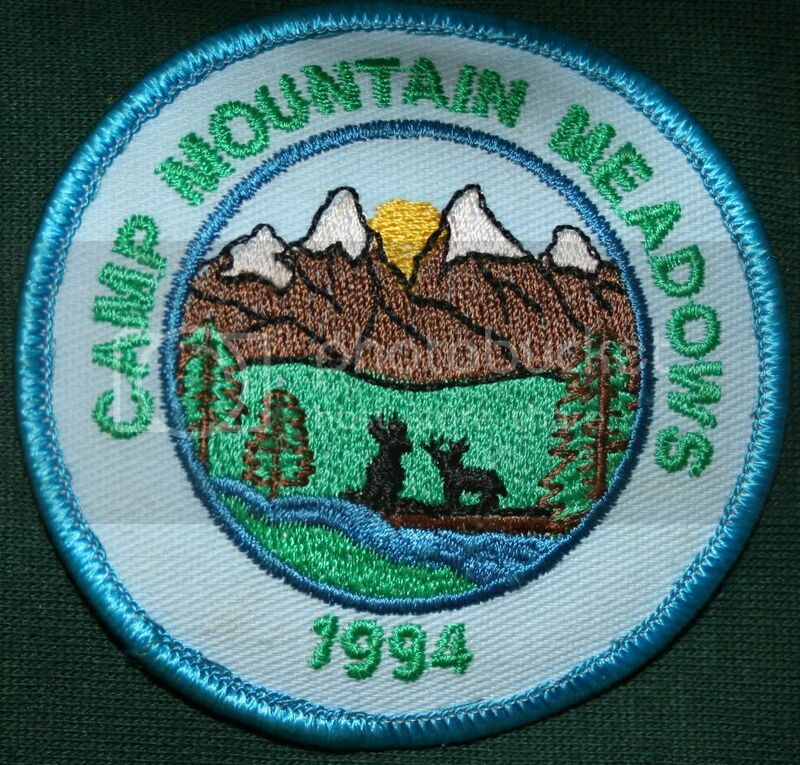 Camp Mountain Meadow (Non GS). Mountains, and deer. 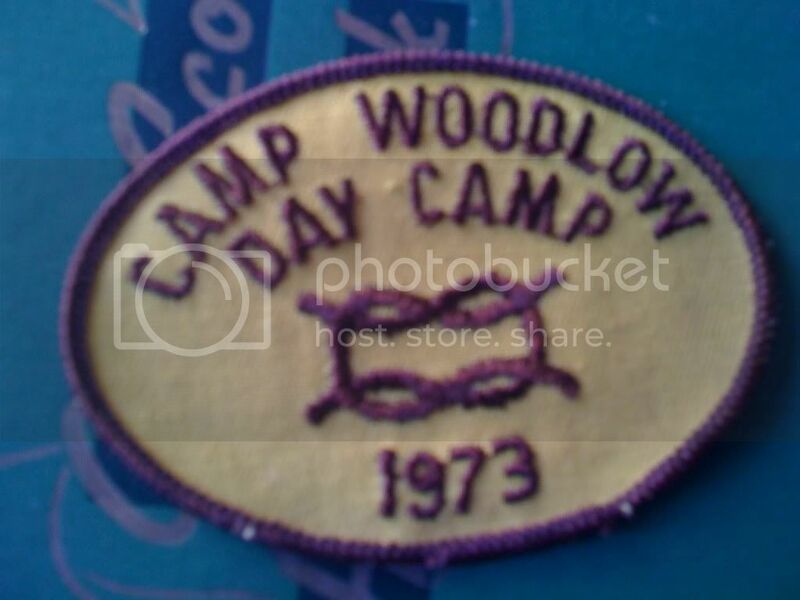 Bear Creek Aquatic Camp: from the early 1990's, sailboat on blue and yellow. I have extras for trading! 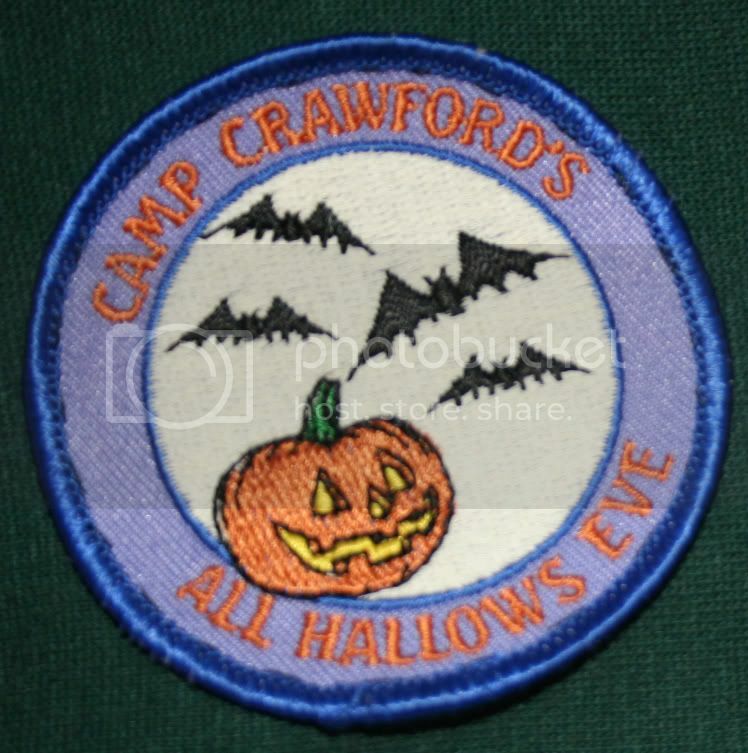 Camp Crawford: All Hallows (various) 1, 2. 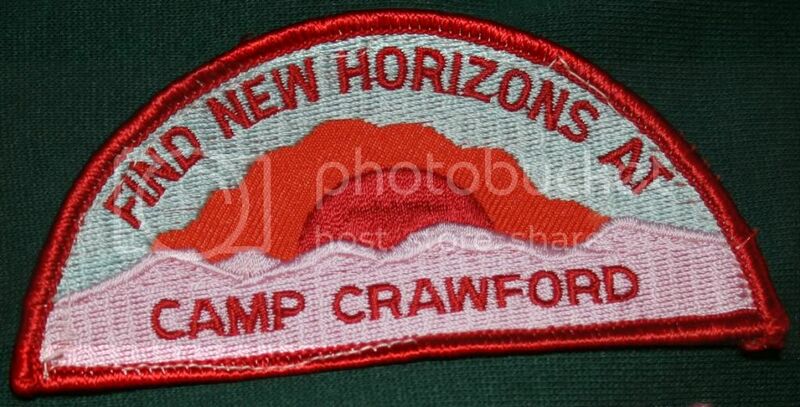 Camp Crawford: "Find New Horizons." 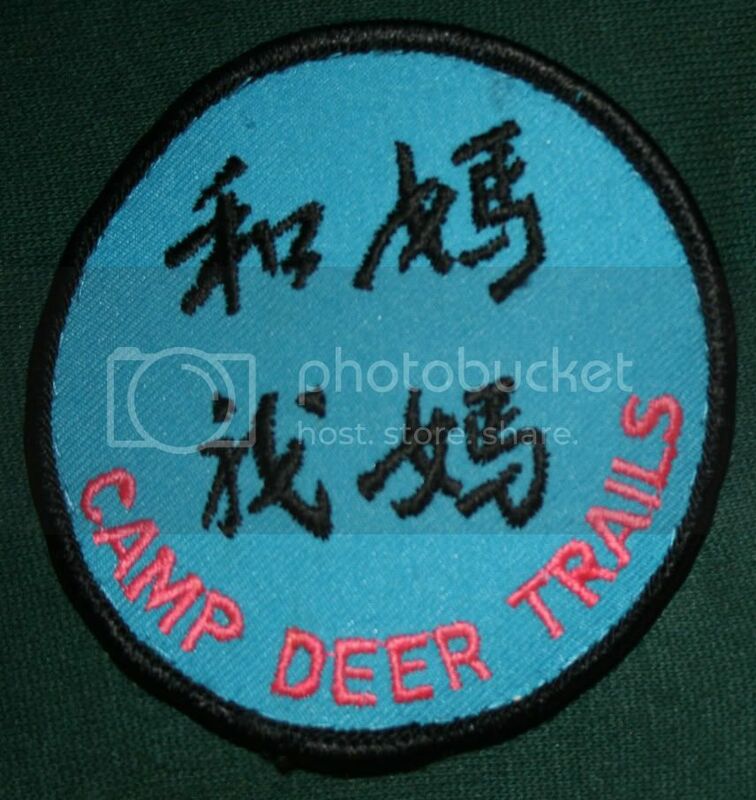 Camp Deer Trails: Chinese/Kanji? 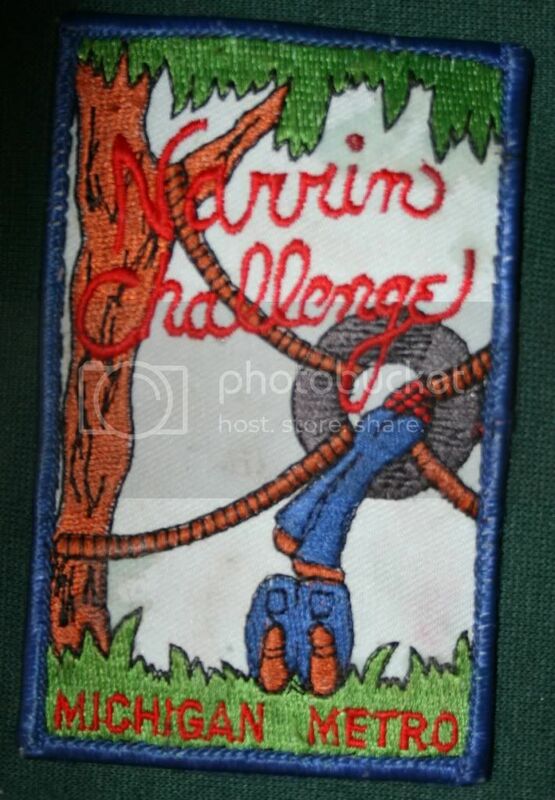 from the early 1990's. I have an extra to trade! 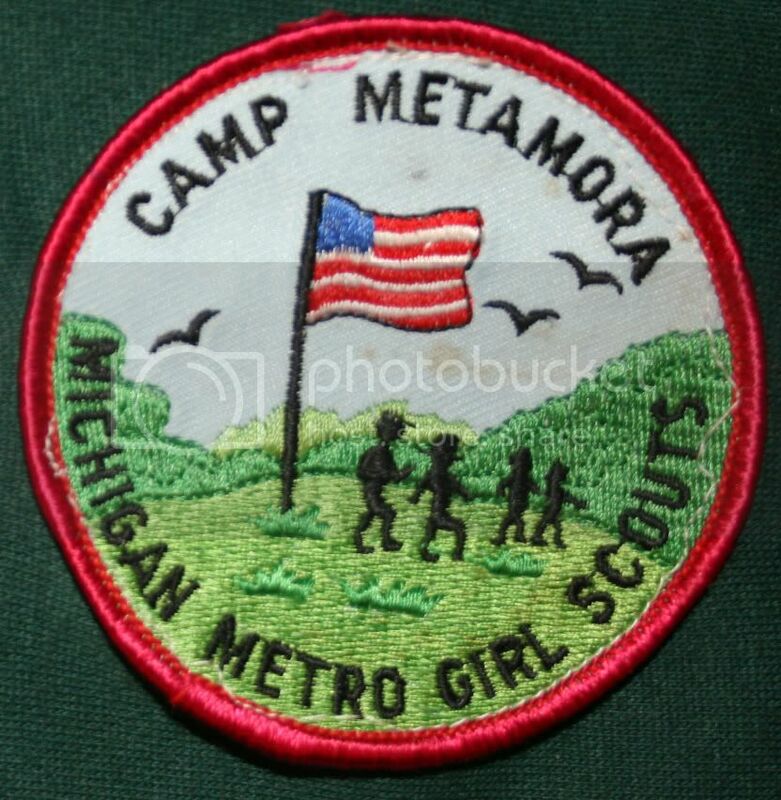 Camp Metamora: Girls on a hill with the US flag. 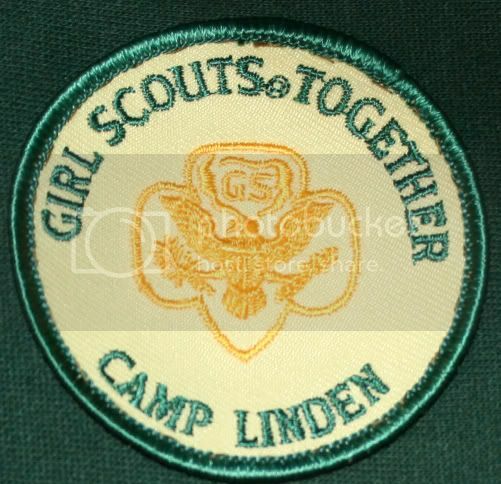 *Note: I will trade for, or buy, ANY Camp Narrin, Metamora, or Innisfree patch. 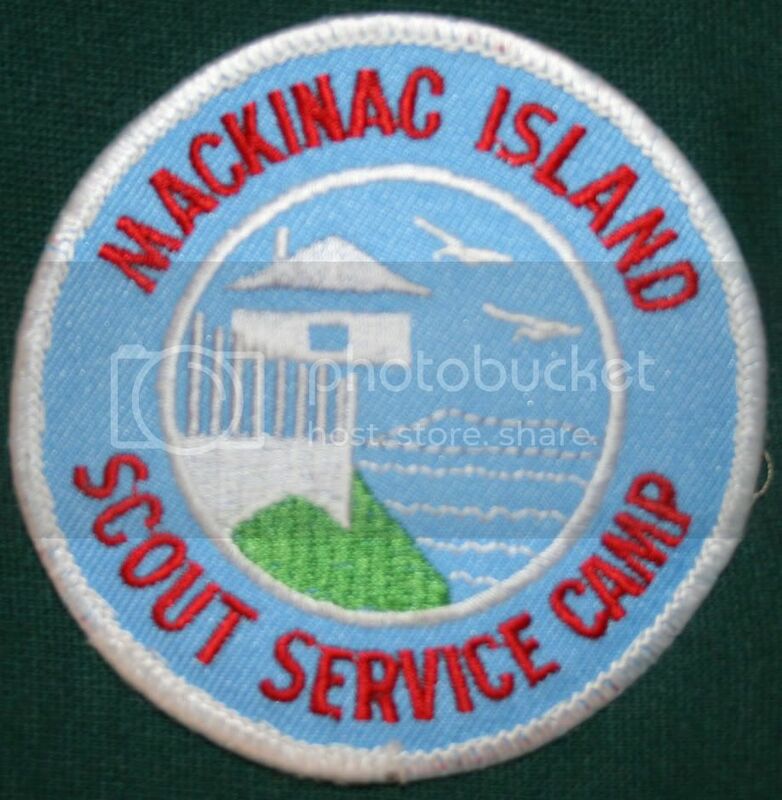 Mackinac Island Scout Service Camp: Fort, water, and gulls. 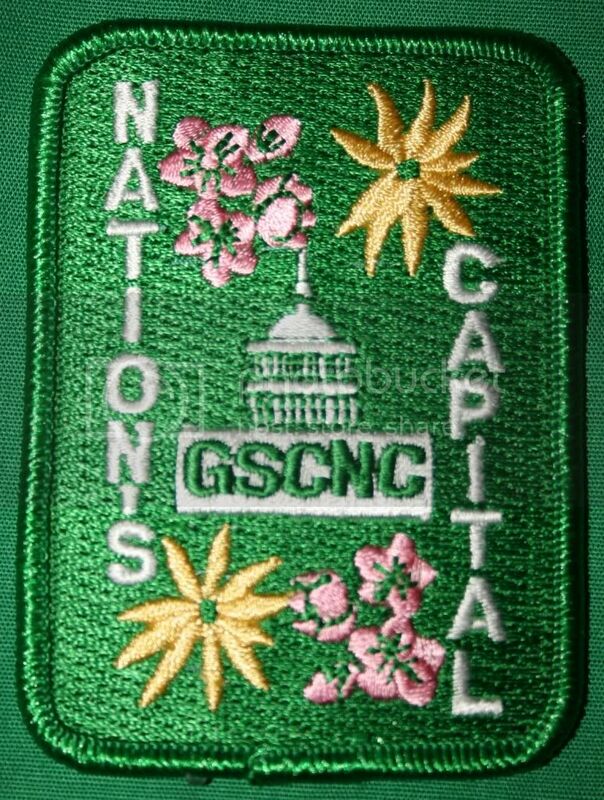 Unlike most camps, this is actually an honor guard position for GS and BSA (alternating weeks) throughout the year on Mackinac Island. 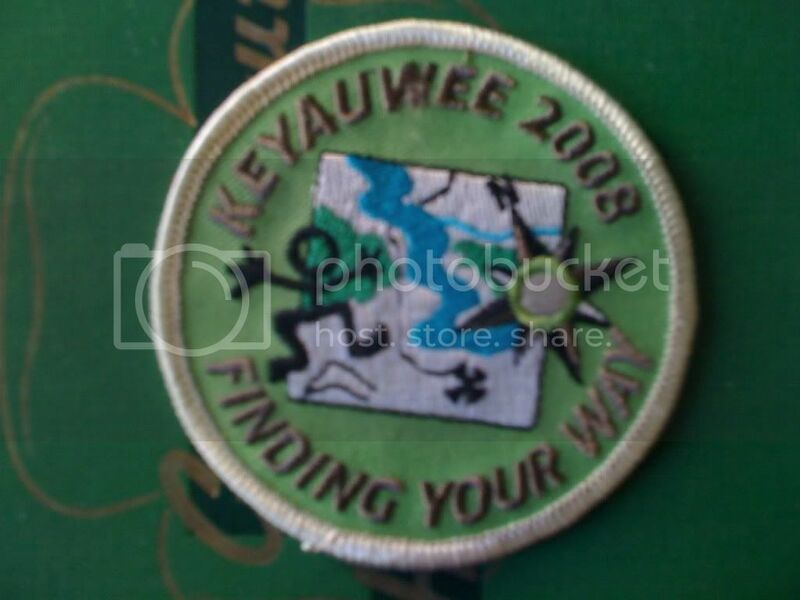 Scouts raise and lower the islands many flags, and assist visitors around Fort Mackinac and the Island. 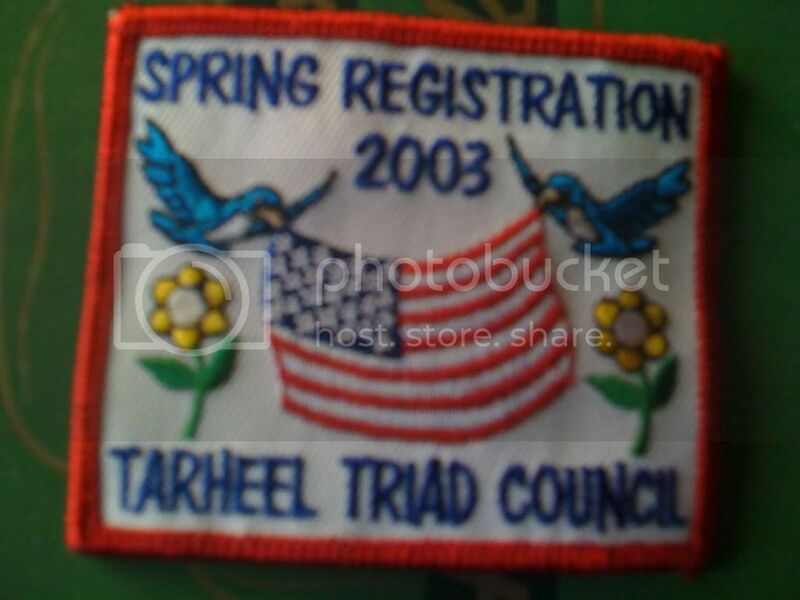 You have to apply and maintain an exceptional scout status to be part of the honor guard. 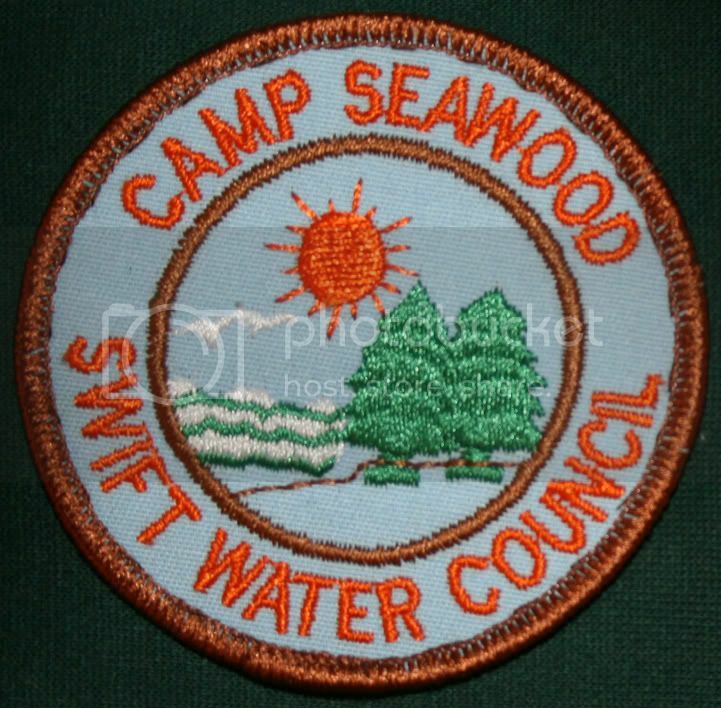 Camp Seawood: Water, pines, and the sun. 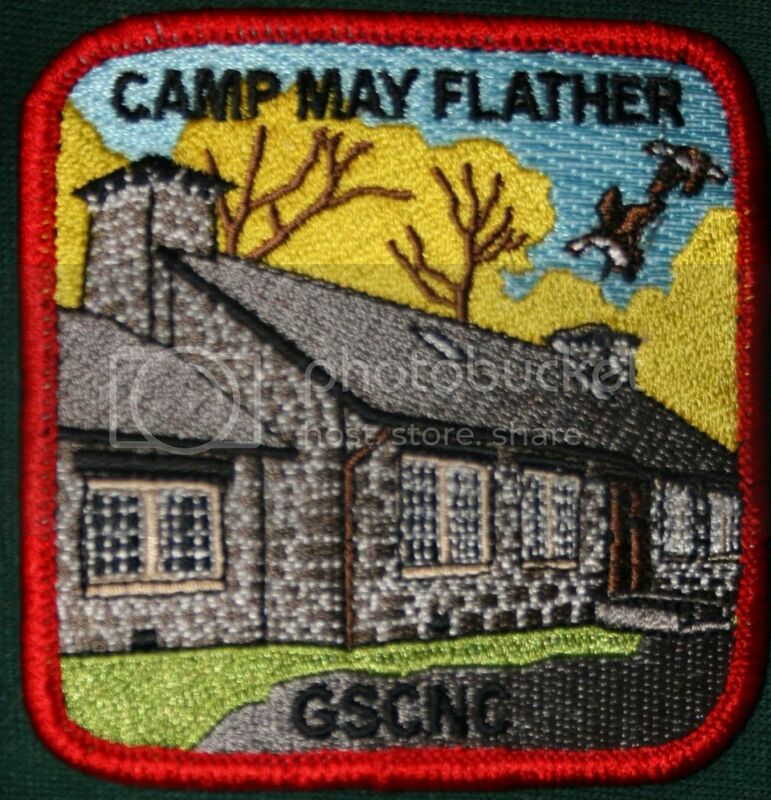 Camp May Flather: Old Patch. 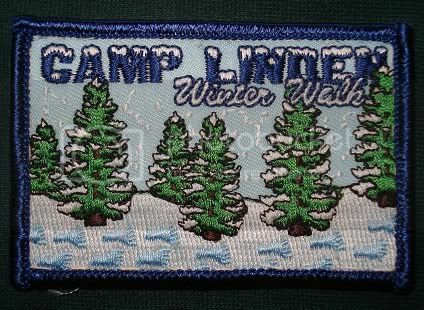 Green border, a river, pine tree, and sunset. 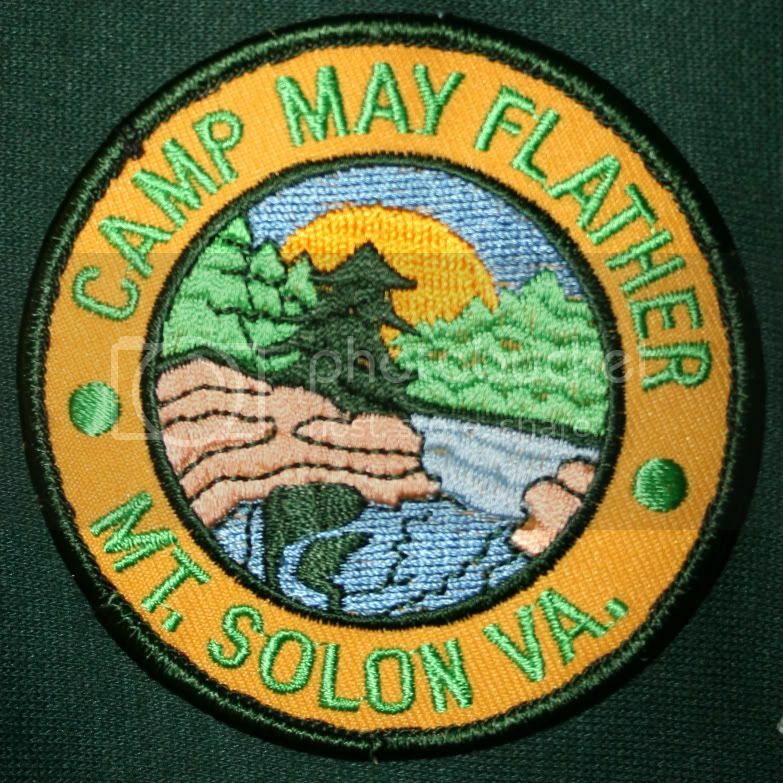 Camp May Flather: New Patch. A stone building with geese and fall trees in the background. 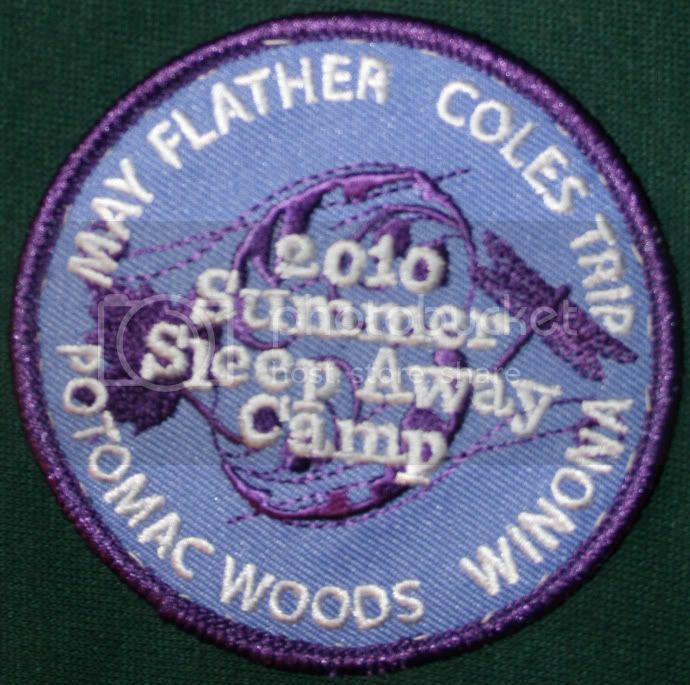 Camp May Flather, Coles Trip Camp, Camp Potomac Woods, and Camp Winona: Sleepaway 2010 patch. 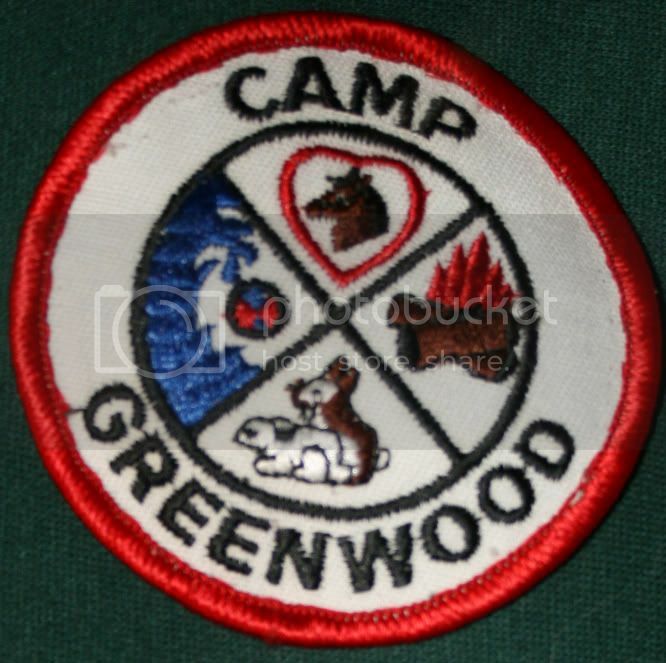 Camp Greenwood: I do not think this is a GS camp. 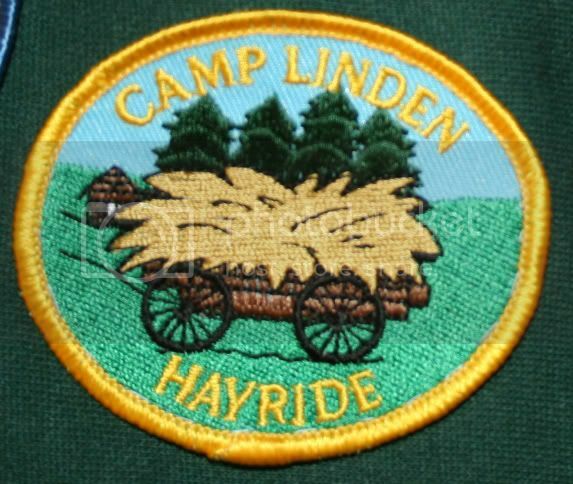 Has a rabbit, horse, campfire, and water in a circle divided in fourths. 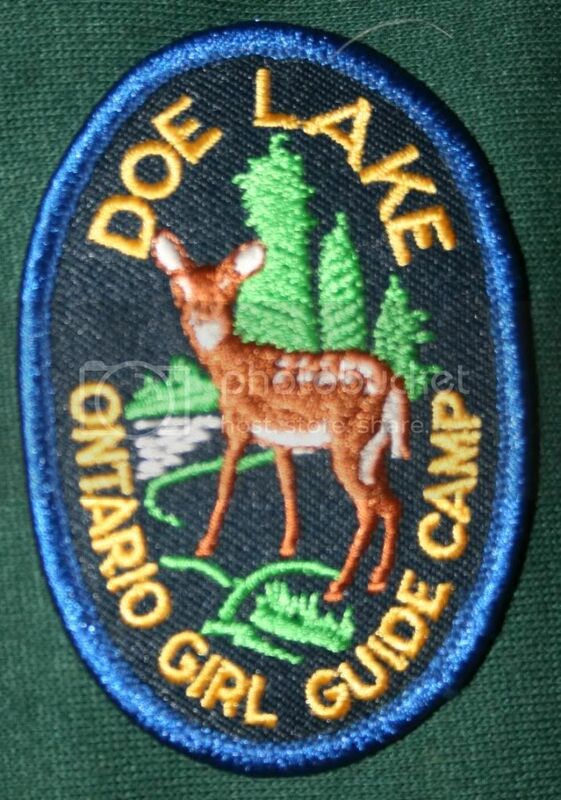 Doe Lake Girl Guide Camp: Fawn near a lake on dark blue. If you would like to trade, email me or check out my available trades list! 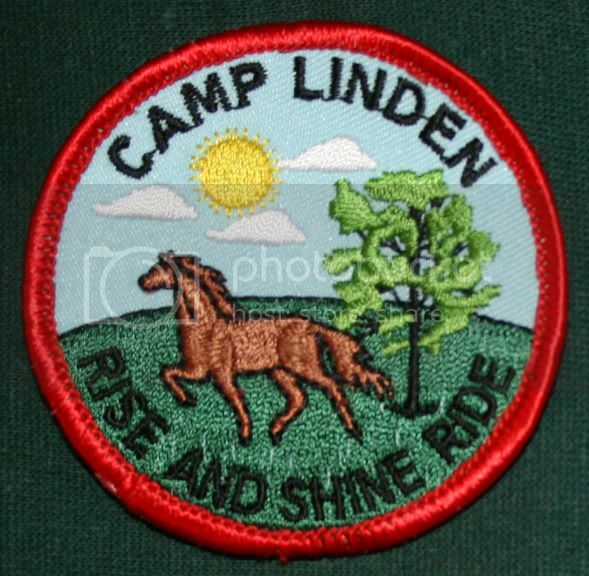 I am a graduate of Eastern Michigan University living in the not-that-big city of Washington, DC and missing the woods, and grass, and non-domestic animals. 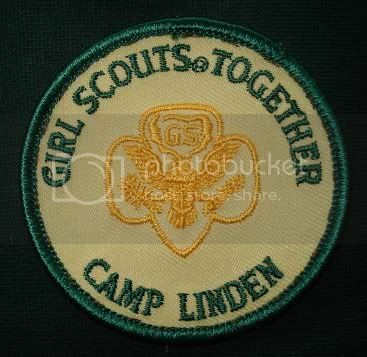 This page is not sponsored by, affiliated with, or otherwise connected to GSUSA or WAGGGS. 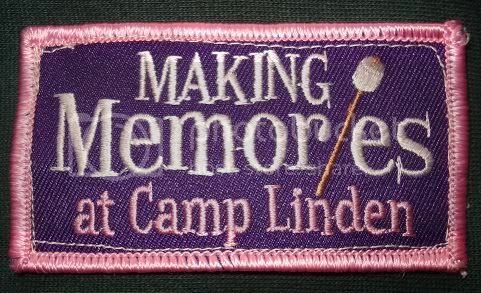 Anything written here is work of the author unless otherwise cited, and not necessarily the views of the Girl Guides or Girl Scouts. This webpage is not for profit.